In the spring and summer soups need to be quick and easy, it is not the time for the heavier soups of the winter. 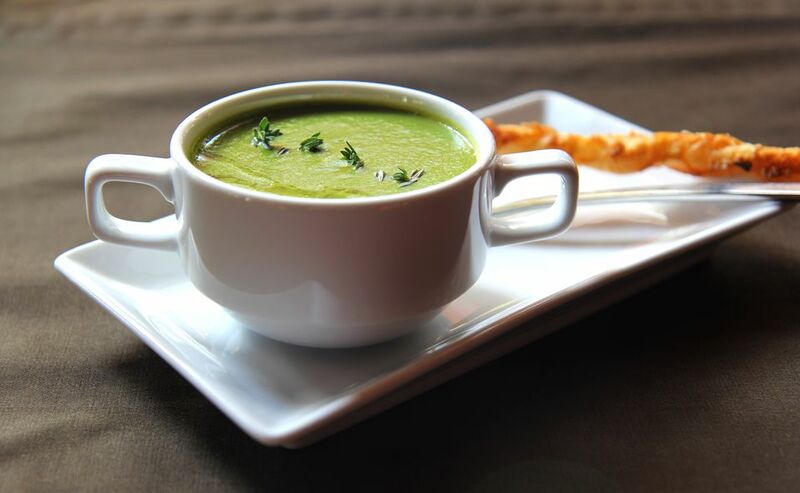 Pea and mint soup is so easy; you will be delighted in its simplicity. Fresh summer peas (you can even use frozen), and garden mint is a match made in heaven; their combination in any recipe is delicious. Gently heat the oil and butter in a large saucepan, add the chopped onion and cook over a gentle heat for 10 minutes or until the onion is soft but not brown. Stir continuously Keep to make sure the onion does not burn. Add the garlic and cook for a further 3 minutes, again stirring. Add 3/4 of the fresh or frozen peas, the chopped mint leaves, and 3/4 stock. Cover the saucepan with a tight-fitting lid and cook on a medium boil for 10 minutes. Once cooked, blend the soup in a food processor, to create a thick puree. Return the puree to the pan, season with salt and pepper and add the remaining peas and stock. Cook for a further 5 minutes to ensure the newly added peas are cooked. If using grated Parmesan cheese, place a small mound in the center of a warmed soup bowl. Pour the warm soup around the cheese. Drizzle with a few drops of the extra-virgin olive oil. Serve immediately with warm, crusty bread on the side. Serve the soup hot or cold, but never chilled, it does not suit the flavors. The soup recipe above is a classic combination but this does not mean you cannot ring the changes. Mint is the traditional herb to match with the peas, but thyme can also work well, but approach with caution and use sparingly, Thyme can be overpowering to the delicate flavor of the peas. A cheaper alternative to the Parmesan cheese and just as tasty is Grano Padano. Don't like the flavor of Parmesan then use a finely grated Emmenthal or Gruyere.